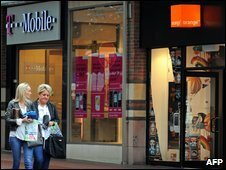 T-Mobile and Orange plan to merge their UK businesses, creating a mobile phone giant with 28.4 million customers. If completed, a deal between Deutsche Telekom's T-Mobile and Orange owner France Telecom would see a firm with sales of 9.4bn euros (£8.2bn; $13.5bn). It would be the UK's largest provider, overtaking Telefonica's O2, with about 37% of the mobile market. It is the second large corporate action in two days, after Kraft Food's £10.2bn takeover proposal for Cadbury. Orange and T-Mobile said their deal - due to be signed by November - would "bring substantial benefits to UK customers", and promised expanded network coverage, better network quality and improved customer services. However, it is likely that competition authorities in the UK and EU will probe the deal. Both brands would remain separate for the first 18 months after the deal was completed while branding options were reviewed. This deal - if it goes ahead - will shake up the UK mobile market. Both brands would stay for a while - but the Orange name is tipped to remain long-term. Being market leader would give it clout when it came to the handsets available. Neither Orange or T-Mobile offer "must have" phones such as the iPhone and Blackberry Storm - but this could change. And the firms promise customers will get better network coverage - and there's potential for investing in better, faster 3G networks and data access through mobiles. But not everyone will be happy. The range of tariffs offered by the two companies is likely to be scaled back. Meanwhile, just three major players in the UK mobile market would mean less consumer choice. Which? surveys suggest Orange and T-Mobile have worse customer service than their rivals - and meshing company databases together will bring another challenge. 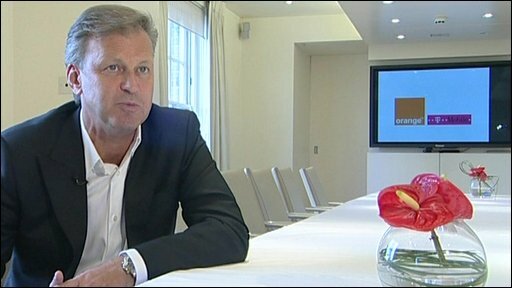 Orange chief executive Tom Alexander would lead the new company, with T-Mobile's UK boss Richard Moat as chief operating officer. Orange employs 12,500 people in the UK, while T-Mobile has a UK workforce of 6,500. A spokeswoman confirmed there would be "efficiencies" that could be made across both businesses - but said it was too early to give details of any impact on staff. Integrating the businesses would cost between £600m and £800m, the firms said. This bill would include decommissioning mobile phone masts, cutting back the network of stores and streamlining other operations. Over time, savings should reach about £3.5bn, they added. UK mobile phone operators would welcome consolidation in the sector said lawyer Chris Watson, of CMS McKenna, adding firms saw the current levels of competition as "ruinous" because of how low they had to keep prices to win customers. There was very little prospect of the deal being approved by regulators without some alterations, he added, and said "alarm bells will be ringing" about price increases. Customers on existing contracts would not see their tariffs changed, he said. "But when your contract comes up for renewal you may well find the price is more expensive." Mobile phone analyst Nigel Hawkins told the BBC that it was not unprecedented for a firm to have more than a third of a European country's mobile phone market. "If the deal goes ahead, then this merged firm, along with O2 and Vodafone will have more than 90% of the UK market and there will be concern that there remains plenty of competition and that this position is not abused." Deutsche Telekom said earlier this year that it was considering its options for its UK business - which has struggled to win customers in the highly competitive market - which sees five operators and several smaller players compete. Observers say that a joint venture would allow the German firm to avoid the write downs it could face if forced to sell T-Mobile UK for less than it hoped. Meanwhile, for France Telecom, the deal is a way to strengthen its position in the UK market without paying cash or taking on vastly more debt. T-Mobile is currently the fourth-largest mobile operator in the UK, with a 15% share of the market. O2 has a 27% share, followed by Vodafone (25%) and Orange (22%).